Almost 700 middle school and high school musicians came together in Alice to take part in the 9th Annual Dia Del Mariachi Group and Vocal Competition at Alice High School. The UIL-sanctioned competition was hosted by Coastal Bend College and Alice High School. Overall winning groups and vocalists performed onstage during Mariachi Showcase, an evening concert featuring Mariachi Campanas de America. In the group competition, Houston High School for the Performing and Visual Arts took home the trophy for Overall Division I High School Group Winner. The school Mariachi won a Division I trophy for 5A High Schools and earned Best Group Vocals, Best Trumpet Section and Best Violin Section. Edinburg North High School won Overall Division II High School Group Winner. The group won a Division I trophy for High School 5A/4A Division II. The high school Mariachi earned Best Trumpet Section and Best Violin Section. Veterans Middle School in Rio Grande City won Overall Division I Middle School Group Winner. The group also earned a Division I trophy for Middle School Division I 8th Grade Varsity. They swept the competition in their division with Best Group Vocals, Best Rhythm Section, Best Trumpet Section and Best Violin Section. Austin Academy of San Antonio took home the title of Overall Division II Middle School Group Winner. The middle school group earned a Division I trophy for Middle School Division II 7th and 8th Grade. The group earned top honors as Best Trumpet Section and Best Violin Section and tied with L.J. Christen Middle School in Laredo for Best Rhythm Section. In the vocals competition, Juan Gonzalez of H.M. King High School in Kingsville was named Overall Vocal Winner High School Division and earned a Division I medal in the high school competition. Catherine Gonzalez of Kingsville Middle School was named Overall Vocal Winner Middle School Division and won a Division I medal in the middle school competition. Javier Esquivel of C.M. MacDonell Elementary School in Laredo was named Overall Vocal Winner Elementary School Division. A complete listing of competition results follows. For more information about Dia Del MariachiTM visit the college’s website at www.coastalbend.edu. More than 850 middle and high school students converged at Alice High School to celebrate mariachi musicality last Saturday (April 17). Coastal Bend College’s 8th Annual Día Del MariachiTM Vocal and Group Competition attracted middle school, junior varsity and varsity school competitors in many aspects of mariachi music. The judged event showcased the talents of 41 youth mariachis and 37 individual vocalist competitors. 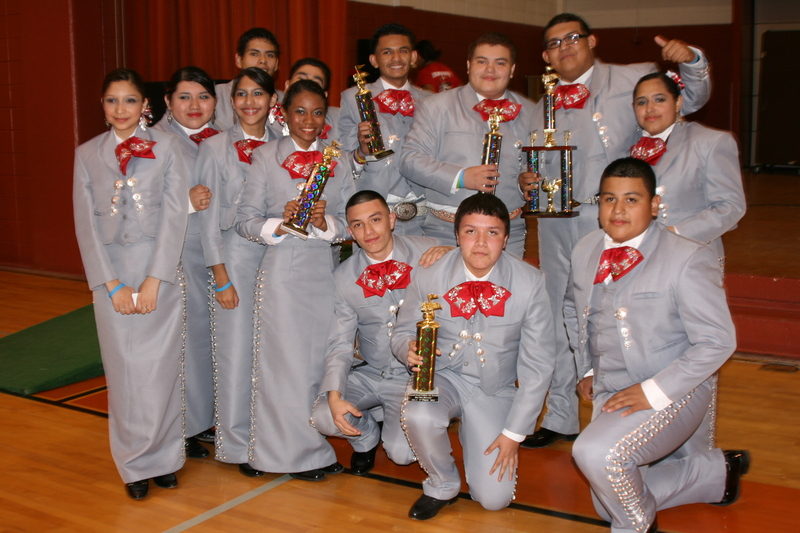 Rio Grande City High School Mariachi Cascabel (Div I 5A) won Best Overall Dia Del Mariachi Group. Valley View High School (Pharr) Mariachi Nueva Era (Div I 4A) was named Best Overall High School Groups 4A Schools; and Stephen F. Austin Academy (San Antonio) Mariachi Los Tigres was named Best Overall Middle School Group. Enny Velasquez of Victoria Memorial High School was named Best Overall High School Vocalist; Nicolas Mena, a 7th grader from Valley View Middle School in Pharr, Texas, was named Best Overall Middle School Vocalist; and Alyssa Guerra, a La Gloria School 5th grader from Falfurrias, was named Best Overall Elementary School Vocalist. Each best overall group or performer was honored with an encore performance during Mariachi Showcase, an evening concert featuring Mariachi UTPA and Mariachi Los Arrieros Del Valle. Results for Dia Del MariachiTM Competition 2010 follow. Results, by school, for Dia Del MariachiTM Competition 2010 follow. On Saturday April 17, Alice, Texas will host the largest Mariachi competition venue in the state of Texas. Coastal Bend College and Alice Independent School District host the 8th Annual Dia Del MariachiTM with over 40 groups and over 800 mariachi students competing in high school and middle school divisions. Vocal, Middle School Group and High School Group competitions begin at 8:30 a.m. at Alice High School. The public is invited to attend and to listen to some of the Texas’ finest young mariachi ensembles. Admission is $2 per person. The Saturday evening concert features the Overall Winners from the day’s competition. The number one university Mariachi in the nation, Mariachi Juvenil UTPA, will also perform. Mariachi Los Arrieros del Valle, recognized as the best professional performing mariachi in Texas, will headline the Mariachi Showcase. Concert tickets are available at Coastal Bend College, 704 Coyote Trail, in Alice for the general public. Tickets are $10 for adults and and $5 for children. They can be purchased in advance or at the door for the same price. Mariachi Showcase starts at 6:30 p.m.
Falfurrias High School >>>>>8:40 – 8:49 a.m.
Mathis High School >>>>>8:55 – 9:04 a.m.
Mission: Veterans Memorial High School >>>>>9:09 – 9:18 a.m.
High School Judges Break >>>>>9:35 to 9:55 a.m.
Roma High School >>>>>10:00 – 10:09 a.m.
San Antonio: Southwest High School >>>>>10:13 – 10:22 a.m.
San Antonio: South San High School >>>>>10:26 – 10:35 a.m.
Beeville: A. C. Jones High School >>>>>10:39 – 10:48 a.m.
TBA >>>>>10:52 – 11:01 a.m.
Somerset High School >>>>>11:05 – 11:14 a.m.
Edinburg: Johnny Economedes High School >>>>>11:18 – 11:27 a.m.
Valley View High School >>>>>11:31 – 11:40 a.m.
High School Judges Lunch Break >>>>>11:45 a.m. to 12:45 p.m.
Victoria Memorial High School >>>>>12:46 – 12:55 p.m.
Laredo United High School >>>>>12:59 – 1:08 p.m.
San Antonio: Jefferson High School >>>>>1:12 — 1:20 p.m.
Rio Grande City High School >>>>>1:24 — 1:33 p.m.
Hebbronville High School >>>>>1:37 — 1:46 p.m.
Kingsville: H. M. King High School >>>>>1:50 — 1:59 p.m.
Zapata High School >>>>>2:03 — 2:12 p.m.
Laredo United South High School >>>>>2:16 — 2:25 p.m.
Hidalgo Early College High School >>>>>2:29 — 2:38 p.m.
TBA >>>>>2:42 — 2:51 p.m.
For more information, contact J.J. Sanchez at (361) 664-2981 Ext. 3042 or alice2@coastalbend.edu or visit the website at www.coastalbend.edu. Area middle and high schools are scheduled to compete in the Eighth Annual Día Del MariachiTM on Saturday, April 17 at Alice High School, located at 1 Coyote Trail in Alice. Admission is $2 for student competitions. Winners will earn the privilege of performing on stage during an evening Mariachi Showcase featuring Mariachi Los Arrieros del Valle and Mariachi UTPA. Dia Del MariachiTM Overall Vocal and Group Winners will perform at the concert slated to begin at 6:30 p.m. Admission to the evening concert is $10. Tickets are available through Coastal Bend College. For more information, contact J.J. Sanchez at (361) 664-2981 Ext. 3042 or alice2@coastalbend.edu or visit the website at www.coastalbend.edu.